Chocolate. Who doesn’t like it? Chocolate is about enjoying life. It is happiness and indulgence rolled into one. Now, there are those days that call for a bit more than one piece of chocolate. Days where you’d like to feast on it. Indulge. Turn it into an occasion and lick your fingers afterwards. 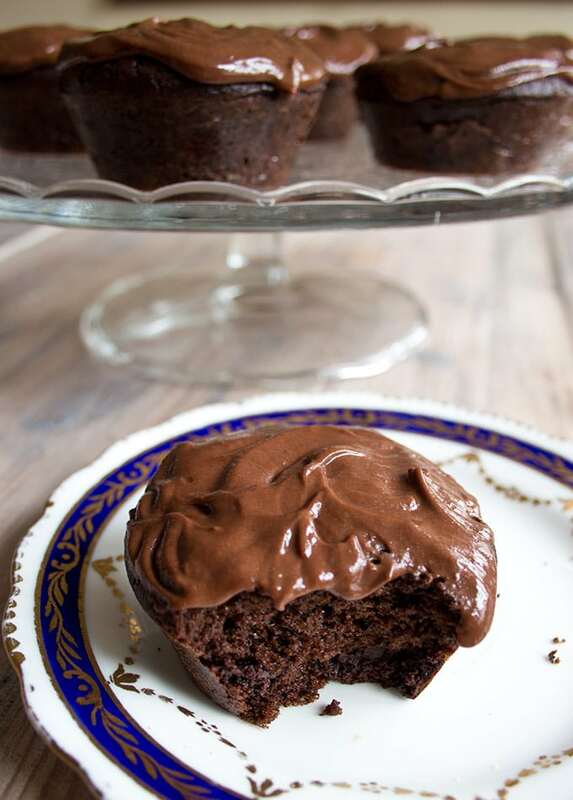 For those days, I have a solution: serve some Keto chocolate cupcakes! These coconut flour cupcakes are just the best! 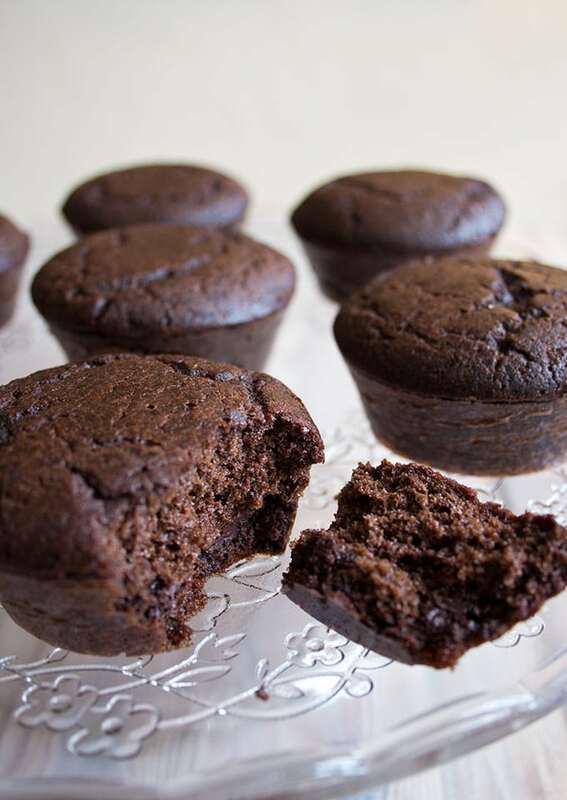 They are deliciously moist and intensely chocolatey, because the recipe calls for cocoa powder AND contains dark chocolate chips. 1.) In a food processor or in a bowl with an electric handheld mixer, blend your wet ingredients – eggs and coconut oil/butter. 2.) Add your dry ingredients – cocoa powder, baking powder, coconut flour, vanilla extract and erythritol (or your sweetener of choice). 3.) At the end, stir in your 50 g of chopped chocolate. I used this chocolate with 90% cocoa solids. 4.) Fill into paper cases or directly into a silicone mould and bake at 175 Celsius / 350 Fahrenheit for circa 20 minutes. If you are watching your sugar intake, you should stick with a chocolate variety that has 85% or more cocoa solids. The thing with chocolate is that whatever is not cocoa is normally sugar. Therefore, if you have a few pieces of milk chocolate (around 40%), your blood sugar will skyrocket immediately. On the other hand, a piece of 90 % dark chocolate has very little sugar and is so intense you’ll feel perfectly satisfied afterwards. To keep it totally sugar free, you could also use store bought sugar free chocolate chips such as Lily’s, though they are pricey. I baked my healthy chocolate cupcakes in a silicone mould. They are fantastic – I love how easy it is to release muffins and cupcakes from it and you don’t need any paper cups. This recipe uses coconut flour, which is grain free, full of fibre and impossibly good for you.Unlike wheat flour, which is essentially glucose and will spike your blood sugar, coconut flour is a versatile low carb baking alternative. I adore coconut flour and have plenty of coconut flour recipes on my site. Check out these low carb waffles, my coconut blondies, a family favourite, or these super-moist low carb pumpkin muffins. 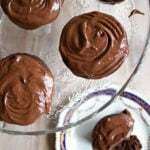 The frosting is a decadent mixture of melted dark chocolate – I used the other half of my 100g bar of 90% chocolate -, heavy cream, butter and powdered erythritol. Wait until this wonderfully chocolatey mix has cooled until it begins to thicken again. Then spread or pipe over your (cooled) sugar free cupcakes. 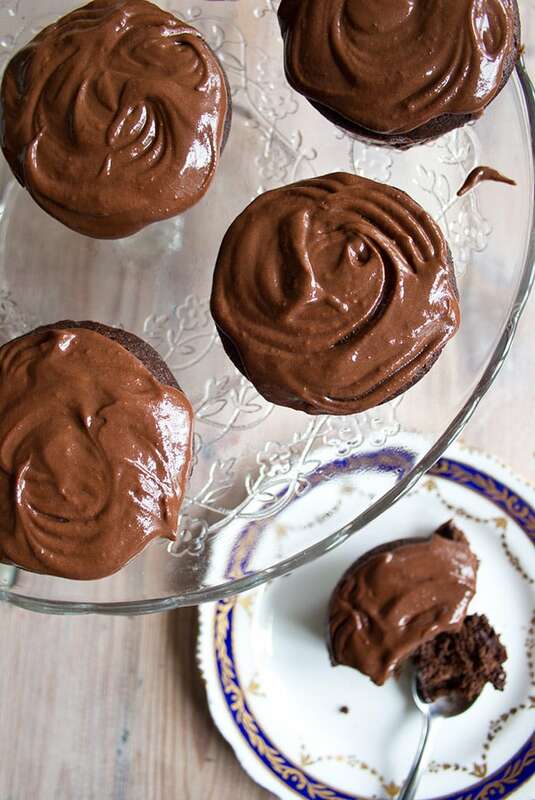 If you’re not into frosting, just leave it out – and turn these cupcakes into yummy Keto chocolate muffins instead. Mix your wet ingredients - eggs and coconut oil/butter plus vanilla extract, then add your dry ingredients - cocoa powder, baking powder, coconut flour, cinnamon and erythritol (or your sweetener of choice). At the end, stir in your 50 g of chopped chocolate. Fill into a silicone mould or into a regular cupcake mould using paper cups and bake for ca 20 minutes. Check that they're done - they should feel spongy when you press on them. Remove from the oven and cool. Melt the other half of the chocolate bar (50 g) in the microwave or in a pan. Stir in the double / heavy cream, butter and powdered sweetener and let it cool until it starts to thicken. Spread over the cupcakes using a fork to make pretty patterns. Make sure you use either a sugar free chocolate such as Lily's or dark chocolate with a minimum of 85% cocoa solids. I used a brand with 90% cocoa solids. Hi Linda, I always give both metric and US cup measurements in my recipes because many of my readers are in the US. Let me know if there is anything in particular I can help you with? These are very good I would just add a little more sweetener. I didn’t put the icing on . Thanks for your comment, I’m glad you like the cupcakes. We all have such a different idea of what is sweet enough – I don’t have much of a sweet tooth. I’ll add in the recipe though to test and if necessary adjust the sweetener before baking. I’m so excited to try these, but I don’t see where to add the cinnamon in the above or below directions. I’m thinking I should maybe omit it. Just made the sugar free chocolate cupcakes- DELISH! even without the icing!!! I use the Lakanto monkfruit (golden) for my low carb baking and I really like it. Thank you for another great recipe! Of course you can sub with stevia powder, just check though that it is a 1 : 1 replacement for sugar, as erythritol or xylitol is. I’ve had stevia powder in the past which was twice as sweet as sugar, so if yours is one of those, make sure you adjust the quantity. Which sweetener has no nasty after taste…? Hi Linda, I like the Sukrin erythritol/stevia sweeteners and recently tried the So Nourished erythritol/monkfruit sweetener, which I also liked. You’ll still get a bit of a cooling aftertaste, but I find that together with the chocolate, which is a strong taste, you don’t really notice it. It’ll never be EXACTLY the same as sugar 🙂 These muffins should be baked at 350 Fahrenheit – I’ll add it to the recipe. Hi. I haven’t used coconut flour before. I use almond meal but thinking of using both now as someone said that almonds have some bad fats in them. Im wondering how only one quarter of a cup of coconut flour makes eight cakes ???. Does it expand a lot ??? Yes, coconut flour is a LOT more absorbent than almond flour. hope you’ll try it – I love it!! These are pretty good, but they are a bit dry. Probably because of the coconut flour. Maybe it needs a bit more butter/coconut oil? Hi love the sound of these and would love to try. Both hubby and my daughter are type 1 Diabetic so these would make a great treat however I’m not keen on the erythritol. Can you suggest an alternative to using this? I also don’t like stevia as it has a horrible after taste. Hello Caron, you could try a mixture of stevia and erythritol (or stevia and xylitol). That way you get less of each taste – that metallic taste stevia can have and the cooling sensation you get from erythritol or xylitol. I do find there are great differences especially in stevia – I recently tried the Better Stevia brand an really liked it. Otherwise you could look into inulin. I have not tried it yet, but it is a low carb sweetener as well. Hi Katrin thanks for your reply. I think I am going to try a fruit substitute either dates or banana? Will see how they go. Cheers. I just discovered your blog because I love baking but we just found out that my husband is prediabetic. I have tried these and I quite liked them. 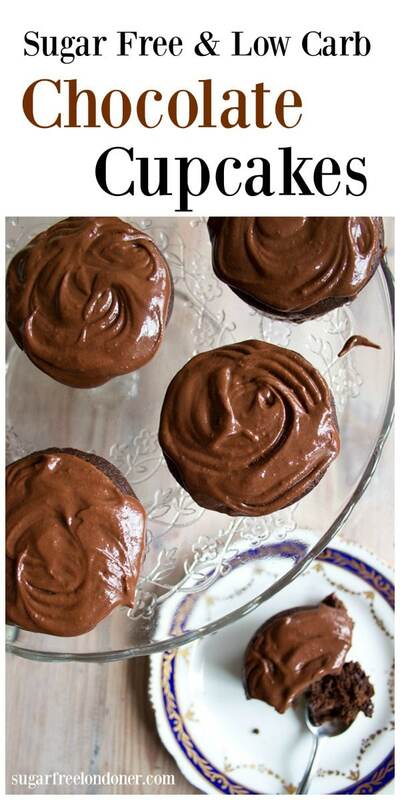 Maybe it would be good to write in the recipe that you first have to let the cupcakes cool down before you put the icing.Do you think it is possible to put a bit of cream in the cupcakes themselves to take away a bit of the bittery chocolate taste? I also personally liked the icing a bit better with less butter and more cream. I used Truvia (erythritol and stevia) as a sweetener which does have a bit of a chewing gum aftertaste….so I’ll look out for Sukrin. Hi Filippa, I’ve added your suggestion to let the muffins cool first to the recipe, thanks for pointing it out. And of course you can add cream to the cupcakes, it’ll be interesting to see how they turn out! In my opinion, Sukrin makes a far more superior sweetener to Truvia. It really is worth trying. I have just made these for my 10 year old son (and me!) who is on a gluten and sugar free diet for health reasons. I am really impressed – they are delicious. I didn’t make the icing but they were definitely good enough without :). I used a combination of xylitol and stevia crystals instead of erythritol because that’s what I had in the house. I just wondered if you prefer erythritol to xylitol and if you have any thoughts on the matter of which is best – there’s a lot of conflicting information on the web! Thank you so much for all of your recipes. I have tried many of them and they are bookmarked as firm favourites. They’ve really been a lifesaver for us. Hello Claire, thank you for your comment and great that you liked the muffins as much as we did over here! I am with you on the icing – it is not really necessary but everyone else in my family likes it. This one is very chocolatey though and not as sweet as other icings! I have settled on erythritol because I am not convinced by the taste of stevia on its own (I find it very metallic and strong and only like it when used in conjunction with fruit such as banana where it is masked enough). The erythritol I use at them moment has a tiny bit of stevia in it (I use Sukrin), which works well. I think erythritol and xylitol taste pretty much the same, but as xylitol still raises blood sugar erythritol definitely wins. I have also heard from a couple of people that they do not tolerate xylitol well and get crampy stomachs. I haven’t had any issues with it, but it’s something to think about when you cook for others. Also, xylitol is toxic to dogs. Hope this helps! These look great! Chocolate chocolate is my favorite cupcake. You had me at chocolate! I love the ease of making muffins. I think they are favorite thing to bake. These look yummy. I can’t wait to try them. Just have a question. Can you replace erythritol with Truvia baking blend? I have never used Truvia, just checked it out online. I am sure you can replace the erythritol with it, though you would increase the sugar content of the muffins. Hope you enjoy the muffins! What pretty muffins (cupcakes?). We’d have to do the chocolate icing at my house or I might have a riot on my hands! 😉 I like that these are made from coconut flour, which is a beautiful high fiber option. Thank you for the lovely recipe. Wow – I just want to sink my teeth into one of those right now!!! LOL! I wish you could. Thanks for stopping by!